Bent and Curved Glass recently completed a challenging installation of architectural glass at the newly built Green Square Community Creative Precinct in Sydney. For the ‘Outdoor Room’ structure at the Green Square project, Stutchbury Architects designed linear skylights that would also serve as the roof gutter system. The roof was created by seven undulating curved copper clad barrel vaults, joined by six curved gutters forming a reverse curve, and sitting neatly between each barrel to a total of 91 linear metres. Glass was the preferred material for the curved gutters to achieve the functionality and aesthetics sought by the architects. The challenge for Bent and Curved Glass was to achieve a 180° bend with flat tangent legs extending up to the roof flashing line. The glass needed to be manufactured within tight dimensional tolerances to ensure water tightness was maintained while achieving maximum light penetration to the area below. The gutter also was required to be trafficable for cleaning and maintenance while the end-to-end joints needed to remain flush to achieve the required water flow. There were several technical difficulties to be resolved during the manufacturing process. Each panel was hand-cut along its length to a raking profile to accommodate the fall required for the rainwater to make its way to the outlet formed by a 150mm diameter hole in the end panel. The end panel was also hand-cut around the curve to the 45° spout profile, which mirrored the splayed end profile of the roof barrels. The design was prototyped to confirm that the required dimensional accuracy and aesthetic characteristics could be achieved. The success of the prototype led to the completion of a unique glass project. The Green Square project was awarded ‘Best Use of Glass in a Commercial Project valued at over $50,000’ at the State and National Glass and Glazing Association Awards 2018. 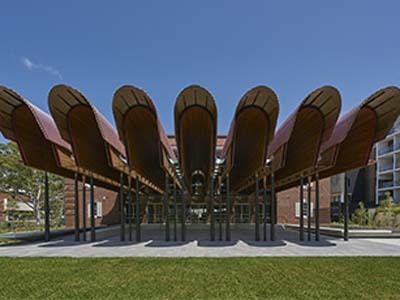 It also received three major awards at the recent Institute of Architects 2018, NSW Awards including the prestigious ‘NSW Architecture Medallion’. The experienced BCG staff work closely with architects, designers, builders and glazing contractors throughout the building process, to create viable, cost effective and beautiful curved glass solutions. BCG can contribute at the design, specification, tender and construction stages to ensure the successful integration of curved glass into projects of any size.